The very well-known Canadian Prime Minister Justin Trudeau called the incoming president-elect Rodrigo Duterte on Tuesday, May 24, and brought up something to him. President Rody Duterte spoke to Trudeau over the phone. According to President Rody during a press conference on Thursday morning, May 26, Trudeau brought up about human rights and the death of a Canadian man at the hands of the rebel group named Abu Sayyaf. Their conversation took almost 9-minute at around 3:30 P.M. (Philippine Time). Mayor-President Rody called their chat as a "civil" one. He said that Canadian Prime Minister talked about the "universal declaration of human rights." Duterte said, "I'm following it. I said that we are partners, may we remain partners for all time." Duterte also give thanks to Canadian Prime Minister Justin Trudeau for the protection of all Filipino workers receive while working in Canada. "I am aware there are Filipinos, a lot of them, working there. I am happy that they have found protection even in the labor laws," he said. Then the President also apologized to Trudeau for the unexpected death of Canadian national John Ridsdel at the hands of the Abu Sayyaf in September 2015. According to Rappler, The head of John Ridsdel was found dumped outside city hall on Jolo, a mountainous and jungle-clad island in the far south of the Philippines. "Please accept my apologies for the incident that resulted in the killing of your national and we will try our very best to make sure nothing of the sort will happen again," President Rody said. Meanwhile, President Rody also have talked to the current United States President Obama via phone last week, Tuesday, May 17. They had a conversation but not detailed as what he had spoke to Trudeau. 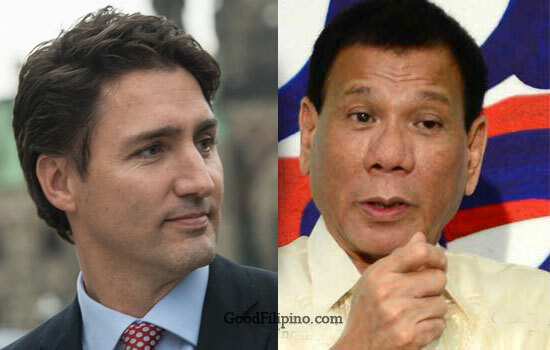 What do you think that Canadian Prime Minister Justin Trudeau reactions to President Rody Duterte? Please point our your thoughts in the comment section below. Comments or suggestions about "Canadian Prime Minister Trudeau brought up something to President Rody Duterte" is important to us, you may share it by using the comment box below.